Unique amongst the various sources of renewable energy, electricity produced from hydropower has the potential for the lowest long term costs. Another key advantage of small scale hydro plants is their low environmental and visual impact and ability to produce energy while actually helping biodiversity. BUT, these benefits only apply with the correct choice of equipment, when installed appropriately. Why OSSBERGER water technology ? 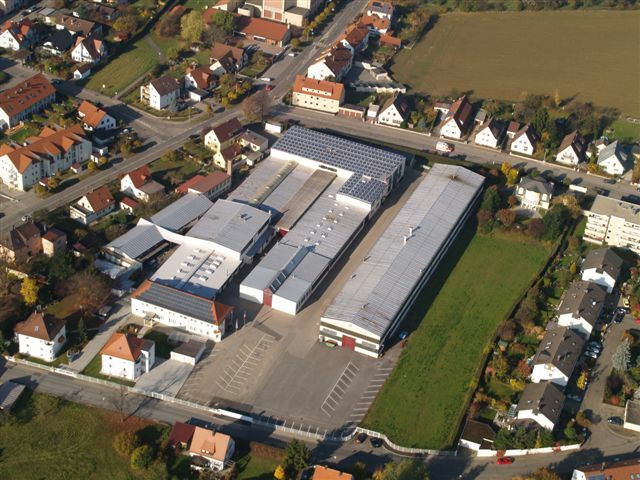 Water21 uniquely represents OSSBERGER in the United Kingdom, because only OSSBERGER, over 4 decades of UK sales have demonstrated the highest reliability and thus the lowest long term costs, offering the best technology available here. 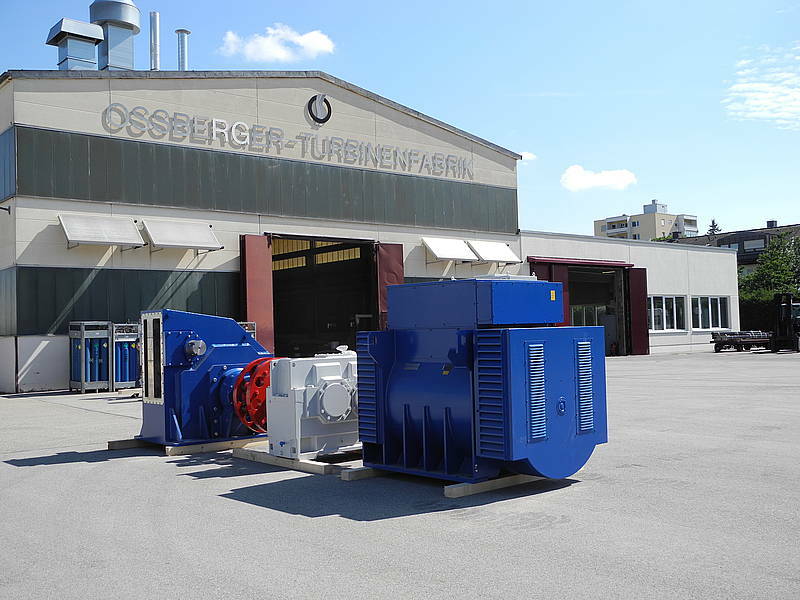 At the heart of the OSSBERGER range of turbines is their patented Cross Flow system (with Kaplan and Pelton systems also available). Their ability to operate efficiently across a wider range of flows and heads, as normally found on many British watercourses. This results in maximising energy output over a wide range of conditions, reducing non-operational time and therefore maximising return on investment and availability of electricity. Long term service which is backed by 100 years of manufacturing expertise. This has resulted in over 10,000 hydro power stations installed in more than 80 countries world-wide. OSSBERGER expertise is available in the design and supply of complete small scale hydro turbine systems from power house components and control systems through to the upstream trash rack cleaners. This provides confidence for investors in any hydro project that with the knowledge that OSSBERGER’s proven reliability will give good financial returns resulting from high quality equipment and optimised matching of system components. Why Small Scale Hydropower ? Stainless steel inlet screen at Coaley Mill, manufactured by Water Power Engineering and OSSBERGER hydraulic screen cleaner. This is an example of the sensible use of Nature’s gifts, in a sustainable manner. A starting point for numerous individual and communal undertakings, able to provide and improve standards of living, while also looking after our planet. There are estimated to be over 26,000 run-of-river weirs and viable water mill sites in the British Isles. Coaley Mill is one example of two working mills of the 18 mill sites in the Dursley Valley and there are another 150 mill sites in the adjacent Stroud Valleys, and over 500 in total in just Gloucestershire. Properly designed and built quality hydro turbine systems offer many decades of reliable operation. They are an important means of realising our widely dispersed renewable energy resource. Such installations offer profound economic and environmental benefits both to the individual owner and if implemented on a widespread scale, the greater community. 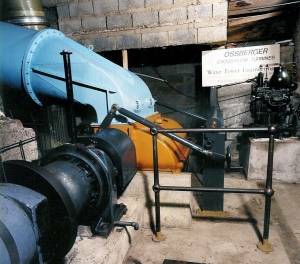 OSSBERGER turbine installed in 1977 at Coaley Mill. The turbine here has been running continuously for 30 years, with only an annual shutdown of up to 48 hrs, for maintenance. Frequently only the hydropower output of a turbine is valued when actually there are numerous other benefits which accrue to the wider river environment from a working plant. These include the removal of rubbish, recovery of valuable humus material (leaves, algae etc) for return to the land, improved water quality and the reporting of pollution. 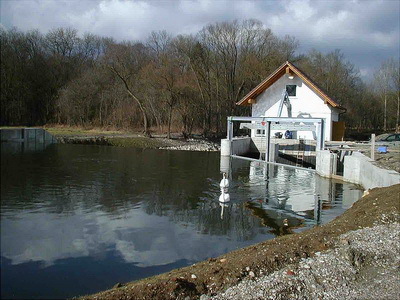 Aeration of water increases the dissolved oxygen levels and thus improves the water quality. It can also improve the effects of intermittent pollutions. An important means of controlling flood and even drought by controlling rapid water run-off after rainfall. The generating stations act as collection points for water-borne litter and rubbish, which is removed as part of routine maintenance. The generating stations become monitoring points for pollution incidents providing early detection that is essential for prompt action and effective tracing of the source. Protecting biodiversity as the best guardian of river water quality and quantity. Turbines are, if correctly installed and operated, the ‘Fisherman’s Best Friend’. The Authorities must better recognise and promote the wider benefits associated with the responsible management of rivers with small hydropower schemes and remove the burdens that inhibit wider community enjoyment of the demonstrable benefits of hydropower. Osman Goring, Water Power Engineering, Coaley Mill, Gloucestershire.